Announcement Please visit our main site to continue shopping Urban OREganics - - - After a few years of running our business on multiple platforms, we've decided to just focus on our main site. We closed our Etsy shop in December 2018, exactly 5 years after we first opened it. We are so thankful to Etsy for all that it allowed us to accomplish, but as business continues to grow, our inventory management was becoming increasingly difficult over multiple platforms. Urban Oreganics' skin care products are handcrafted in small batches and packaged in recyclable containers. We have been lovingly creating in our home studio in Portland, Oregon since 2013. Each new product is tested on willing friends and family, never on animals. Please visit our main site to continue shopping Urban OREganics - - - After a few years of running our business on multiple platforms, we've decided to just focus on our main site. We closed our Etsy shop in December 2018, exactly 5 years after we first opened it. We are so thankful to Etsy for all that it allowed us to accomplish, but as business continues to grow, our inventory management was becoming increasingly difficult over multiple platforms. 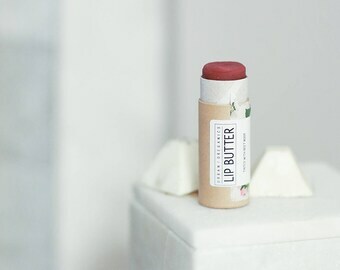 Fresh batch of beet tinted lip butter in production! As a devoted vegan, to say I am health conscious would be an understatement. But eating healthy is just one small piece of the puzzle. Upon reading that it takes 26 seconds for the toxins in our products to absorb into the bloodstream, I vowed to make a change. I was determined to make all my own home and body products, because I wanted everything under our roof to be 100% natural. Realizing that no [sane] person has the time to make all their own natural products, I decided to start offering my creations to each of you in December of 2013. I handcraft everything for Urban Oreganics in my overly clean and organized home kitchen, not a factory. Those who know me best might just say I have a slight case of OCD. But they are also the ones who gave me the little push I needed to start Urban Oreganics, so to them I am much obliged. My dream is to better my customers' lives, one product at a time. As a mama and avid DIY-er, I spend my days remodeling my home, finding treasures at second-hand shops, searching Pinterest for my next project, and taking care of my sweet boys, Milo & Max. Emily’s husband, Cory, left his career and joined our team full time in August 2018. So far his main roles have been streamlining production and shipping orders. We’re so excited to have him aboard so we can continue to grow UO! Every order is packaged as if it were a gift. If you'd like a personalized tag included, please let us know in the note at checkout. Once your package is in the possession of USPS, delivery times and care are out of our control. We suggest upgrading your shipping method to "priority + insurance" at checkout. Without this upgrade, we unfortunately are unable to replace any lost or damaged packages. Thank you for your understanding.